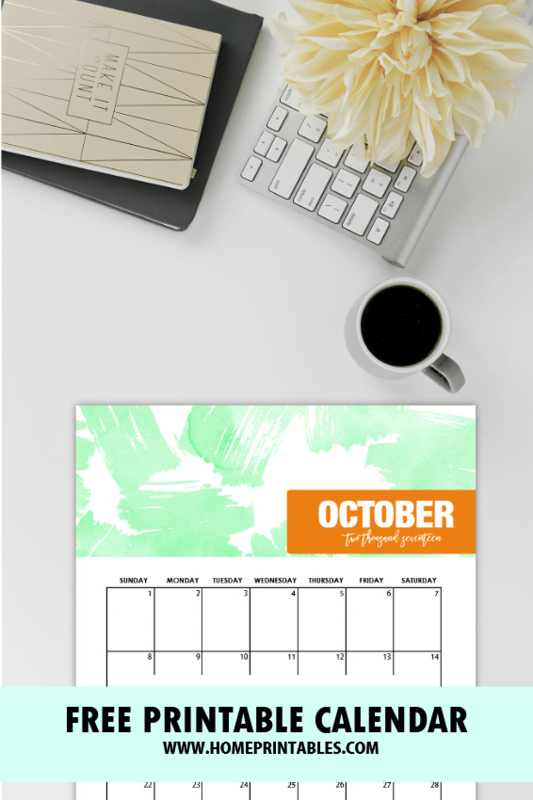 October Calendar 2017: 8 FREE Designs! 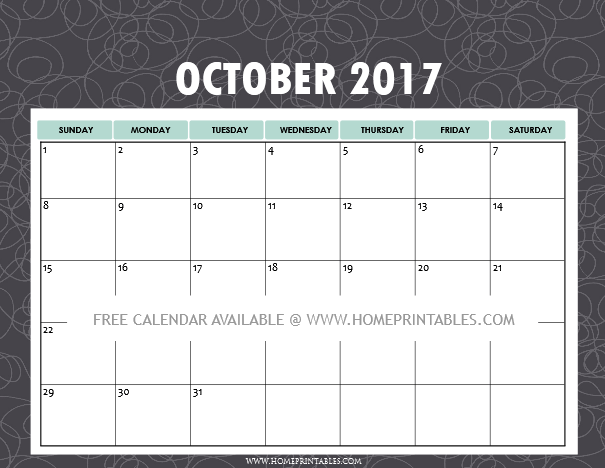 Looking for October calendar 2017 to print? We’re so happy to share with you our new designs. There are 8 styles to check out from this post. Sit back and relax as we take you to this quick calendar preview! Oh hello there! Thanks for dropping by again. 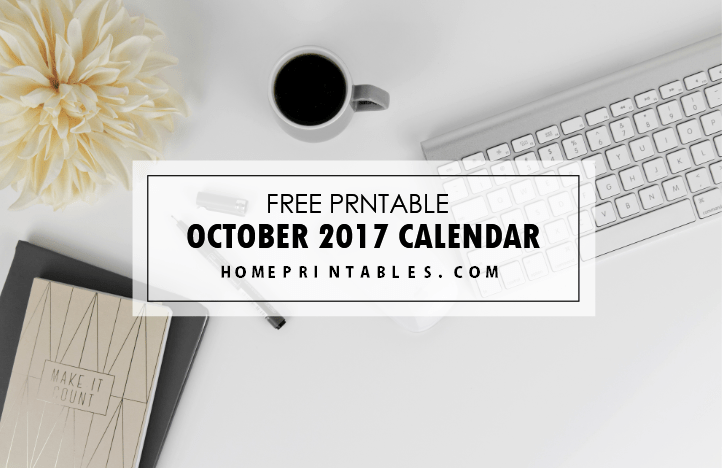 We’re pretty sure that by now, you already know the drill: Home Printables releases a set of calendars each month that you can all print for FREE! This month’s styles are mostly easy on ink, simple, and clean. Let me show you what we have! 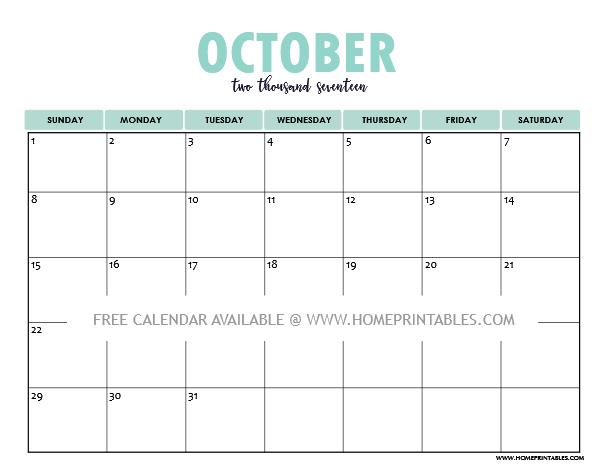 In search for a clean and easy calendar to use? 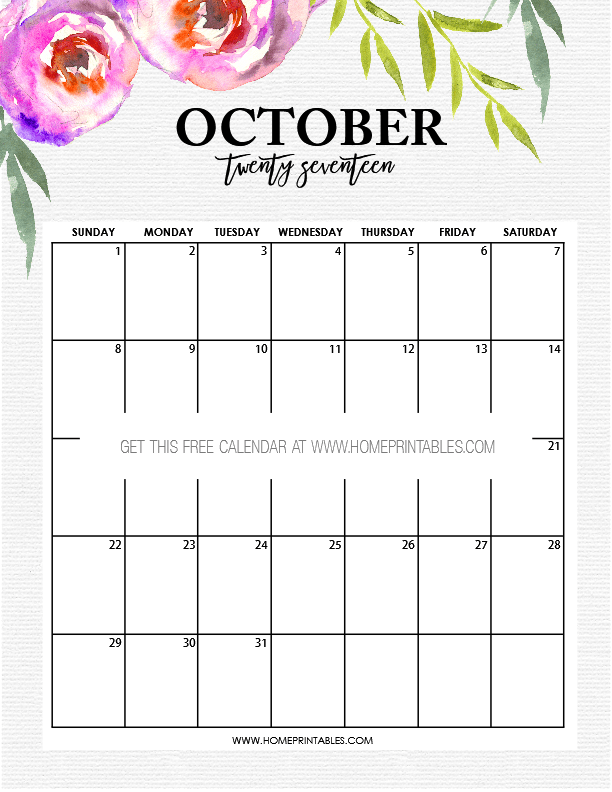 This first calendar that we’re sharing comes simple and bright which makes a great choice! It’s great to use to organize your monthlies! In the mood for floral prints? You will love this one. This particular style makes a great calendar to use in your meal planning, to be posted on your kitchen fridge. Won’t it add freshness to the kitchen or dining area? 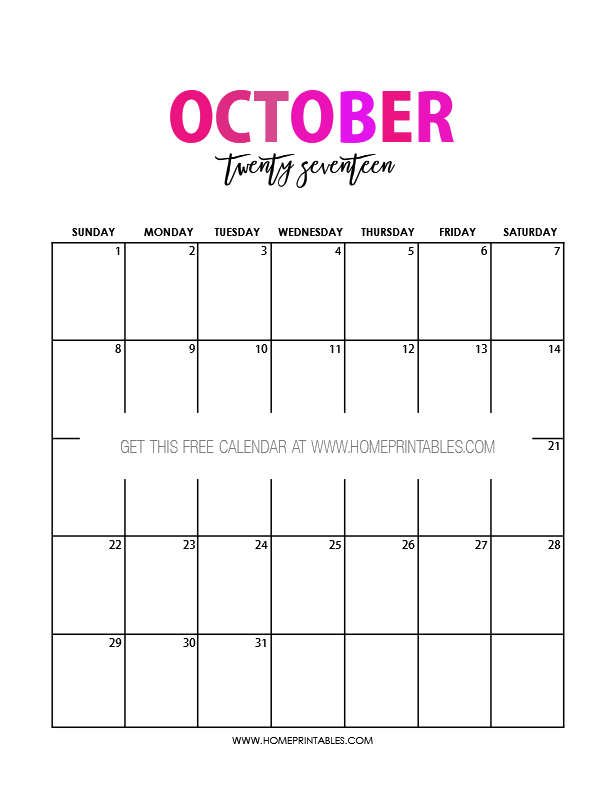 Your little ones need a calendar? This brightly colored one will work for them. Look at that playful colors. 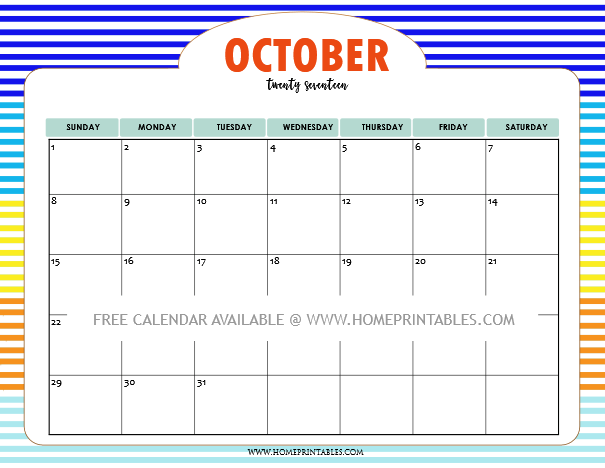 We think this October calendar will make a great addition to their school binders! Calling all giggly girls and ladies! This ultra feminine calendar is for you! The month title in pink is LOVE. Isn’t it? Use this to organize your home or work schedules. Here’s a pretty calendar in grey! In the mood for something minimalist? 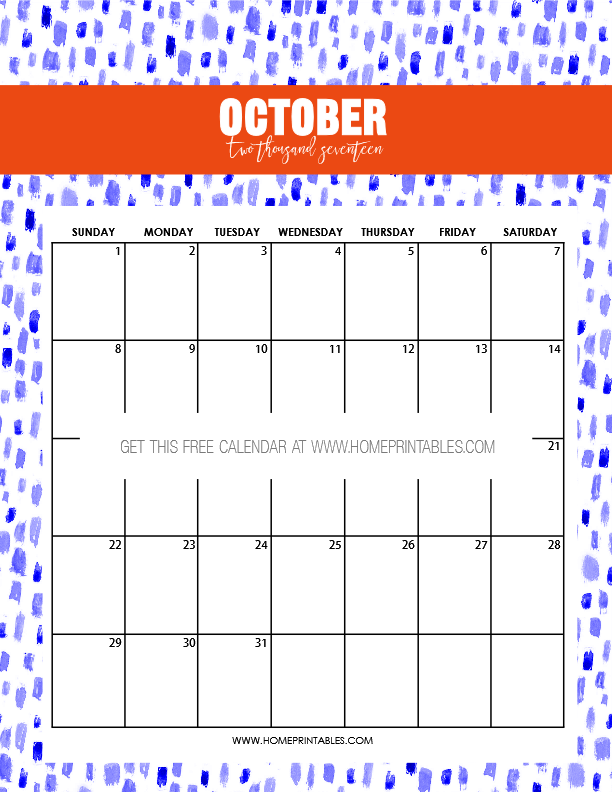 Get this clean calendar to organize your month! 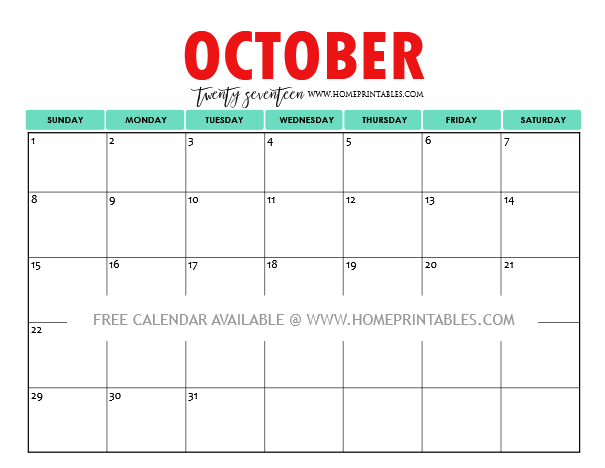 This oh-so-colorful October calendar will set your month to the right mood. While we intentionally designed this for the little ones, even adults like you can enjoy it, too! What’s your favorite design from the set? Ours is the minimalist one. It’s easy on ink plus it has a good room for your notes. Enjoy your calendars HERE and HERE. Enjoy the calendars! Please pin the planner so you can always visit back this post. Thanks! Have a wonderful month, friends! Hi. I love your calendars. Thanks so much for making them. They are beautiful and useful. I’ve edited the links. Thank you! My sincere apologies for the lapse. The links are fixed. Thanks for the heads up!